Long ago an advanced civilization sprang up along the shores of Lake Titicaca, in the Andes Mountains in present day Bolivia and Peru, and disappeared just as quickly 500 years later. The sophisticated people that created the fabulous city of Tiahuanaco (Tiwanaku) were the forefathers of the Incas and other South American cultures, and some even believe they were the ancestors of many Polynesians. Yet knowing all of this, we can only speculate about who they were, from where they came and where they went. Most archaeologists agree that Tiahuanaco emerged suddenly around 300 AD and reached its zenith between 500 and 900 AD. 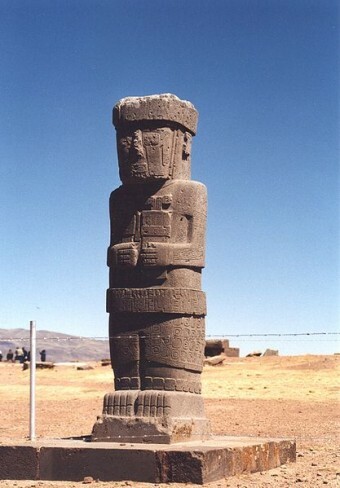 Situated on the western edge of the arid Altiplano, or high plain of the Andes, the unique Tiahuanacoan civilization built an empire from its mountain capital. Despite an elevation of over 12,500 feet, the area enjoyed, at least then, predictable rains and abundant wildlife and forage areas, as well as fertile land that could support a large populace. In order to feed it, the previously unsophisticated Tiahuanacoan farmers built ingenuous raised fields surrounded by twisting water channels, known as suka kollus. Not only providing water for crops, the irrigation channels also absorbed heat from the sun during the day and released it at night to protect crops from frost and freezing – a necessary innovation when your average daily temperature is less than 59 degrees Fahrenheit (15 degrees Celsius). Culturally, the Tiahuanacoans shared attributes with other great South American civilizations. Military might as well as trade were used to increase the Tihuanacoans’ sphere of influence, and by approximately 700 AD, Tiahuanaco had become the dominant player in parts of Argentina, Chile, Peru and Bolivia. Like the Aztecs, Tiahuanaco’s power emanated from an enormous city-state; in fact, estimates of the population of the Bolivian powerhouse range from 285,000 to nearly 1.5 million. Within the city, the previously primitive people were erecting enormous structures comprised of large carved stones, held together with strong metal I clamps, as well as complicated decorative pieces carved from a special green andesite rock. Curiously, most of the large stone building blocks, some weighing as much as 140 tons, were quarried six miles away. The green andesite used for special pieces came from a site located at least 50 miles distant, across Lake Titcaca on the Copacabana peninsula. Although many theories exist, no one knows precisely how they moved these huge stones across such large distances. Major structures at Tiahuanaco include several platforms (Akapana, Puma Punku and Akapana East), three courtyards (Putuni, Kheri Kala and Kalasasaya), a number of gates including the Gateway of the Sun, and a partially underground temple that is decorated with a variety of carvings of unique faces. Many experts believe the Tiahuanacoans’ power derived from their innovative and productive farming. When the climate changed around 950 AD and rainfall in the region dramatically decreased, the resultant drought drastically limited Tiahuanaco’s ability to feed its people. Within 50 years, the great city was abandoned. Insufficient artifacts remain to help archaeologists discern precisely who built Tiahuanaco and where those highly civilized people went when they abandoned the city. Historians who study this culture have had to turn to the folklore of neighboring cultures, passed down through the generations by oral tradition, in order to try to root out the nuggets of fact from the myths. Some of the most ancient stories told by the Incas speak of the god of creation, Viracocha, rising from the center of Lake Titicaca. The Incas believe he made the sun, experimented with at least two other races (which he destroyed, one by fire and the other with a flood), and then created mankind from either stone or clay. According to myth, Viracocha (also called Kon-Tiki Viracocha) suddenly abandoned Tiahuanaco and travelled westward, crossing the Pacific Ocean, founding other cultures and teaching them the fundamentals of civilization. They told the Spaniards that the colossal monuments that stood deserted about the landscape were erected by a race of white gods which had lived there before the Incas themselves became rulers. These vanished architects were described as wise, peaceful instructors, who had originally come from the north, long ago in the morning of time, and had taught the Incas’ primitive forefathers architecture and agriculture as well as manners and customs. They were unlike other Indians in having white skins and long beards; they were also taller than the Incas. Finally they left Peru as suddenly as they had come . . .
Heyerdahl believed that Kon-Tiki did not voluntarily leave Tiahuanaco, but rather escaped and traveled across the Pacific Ocean to Polynesia after losing a war with indigenous Andeans. Heyerdahl averred that upon arriving, Kon-Tiki established civilizations across the archipelago. He supported his theory with evidence such as the Incan and Polynesian stories that Kon-Tiki and his companions had “big ears,” and the fact that “the abandoned giant statutes in the Andes Mountains” as well as the enormous Moai on Easter Island also had elongated ears. The accounts of the first Europeans to visit Rapa Nui support his theory; when they first landed, they found “white men” with “long flowing beards” and the shared myth of Kon-Tiki. Heyerdahl himself traveled the South Pacific, finding consistent stories of Kon-Tiki as “both god and chief . . . who [had] brought the ancestors to the islands” from “a big country beyond the sea” to the east. After developing the theory, he set out to prove that a pre-Incan people, who were known to sail on rafts made from large logs, could have made the 4,000-mile journey from South America to the Polynesian archipelago. In the spring and summer of 1947, Heyerdahl and five companions with little sailing experience did just that. After 101 days at sea on a balsa wood raft that embarked from Callao, Peru, the crew arrived safe and sound at the small atoll of Raroia in the Tuamotu Archipelago in French Polynesia. Heyerdahl did not prove definitively that Kon-Tiki made the journey, but he certainly showed that he could have. I’ve been to Easter Island and can attest that Moai look very similar, although perhaps less sofisticated.